When you work for big corporations, a defined level of professionalism is mandatory. You can’t get your foot in the door without it. There is very little room for bad manners, or strange behaviour, in the world of the blue-chip. Why would there be? Successful corporations can choose from the cream of the crop. And the cream tend to be exceedingly well mannered, and not that strange (or at least able keep up the pretence of normality during office hours). It came as quite a shock to me that these rules don’t always extend to the world of SMEs. My role here at RumbleChat is to help lifestyle companies with their marketing. The majority of these businesses tend to be small. The vast majority of small businesses I encounter operate in a lovely, friendly, considerate and professional manner – I cannot emphasise this enough. They are a joy to work with and making a positive difference to their businesses makes every working day worthwhile. There are however, a small minority, who really let the side down. And it’s to this small, dysfunctional subset that this blog is dedicated. I have worked with several self-proclaimed entrepreneurs…and now give them a wide birth. Not entrepreneurs in general, just the self-proclaimed variety. If you have to proclaim it yourself, then I find that leads to you employing it as a mandate for generally unprofessional/strange behaviour. One client I had took to calling me late at night, when he was stressing about whether the level of unsubscribes for his email newsletters were higher than average. They weren’t, and 10pm really was not the right time to discuss it. Toilets have been a recurring place for strange behaviour. When working on another client’s site, another male MD insisted on using the female toilet, because he, “preferred it,” regardless of the fact that it made the female staff members distinctly uncomfortable. The guy who ate three Cadburys Cream Eggs for lunch deserves a mention; as does the chap who encouraged employees to wear ‘indoor shoes’ to work, in the hope that he could save on cleaning costs. All of these pale into insignificance in comparison to the next tale, however, which blows ‘quirky’ right out of the water. A friend of mine (let’s call her Sally), just had what can only be described as a lucky escape, with a small research company, scarily reminiscent of the League of Gentlemen’s Royston Vasey (if you don’t know it, look it up now, as this is a recurring metaphor!). Run by a husband and wife, and their daughter…I know, I know, alarm bells should have rung at this point! It wasn’t a really tiny one-man-band, though, where you can see how weird practices might prevail – I mean, everyone’s normal is normal to them, right? That’s why it’s helpful to interact with other humans, to check where you’re at on the dysfunctional barometer. No, this looked, at first glance, like a ‘proper’ office, with almost 20 workers, some decent clients, a fairly respectable turnover…and the weirdest practices you are ever likely to encounter this side of Fawlty Towers/Wernham Hogg/the Big Brother House/*outlandishly ridiculous setting of your choice*. Sally’s account of her time there sounds too far-fetched to be true, but she swears (on her cat’s life…and she really loves that cat) that every word is true. The daughter was allegedly Sally’s line manager, but had to keep trotting off to Dad to double check that it was acceptable for my friend to leave early/move onto a new piece of work/scratch her nose/use the toilet. At this point, it’s probably relevant to give you the low-down on Sally. Her career trajectory was impressively vertical. She’s held some senior level, big-hitting jobs in media companies, but, like so many of us, post children, she’s rejected the corporate greasy pole, in favour of flexible, part time work. For her, the closer to home, the better…until now. When she first started, she thought it was quite endearing when Mum told her that they ensure that all the staff eat their lunch together. What she hadn’t realised, was that this actually meant that it was forbidden to leave the building at lunchtime, or eat your lunch at the time of your own, personal choosing. In Royston Vasey Land, the secretary ceremoniously rang upstairs to proclaim, “Lunchtime, everybody down!” at which point you were expected to dutifully shuffle downstairs to sit and eat, while making strained conversation with colleagues. I mean, surely the main purpose of your lunch hour is to take a break and change of scenery to maintain mental health, and ensure you don’t end up punching that really annoying colleague in the face? Speaking of colleagues, by all accounts they were a motley crew. They were all female, bar ‘Dad’ and the bloke in charge of IT, and refilling the printer (the son of family friends of ‘Mum’ and ‘Dad’). A fairly neat split between women who’d worked there since the dawn of time, and graduates/students (who had no other experience of work, and will presumably get an enormous shock if they ever manage to leave Royston Vasey). This was a local [office], for local people, with Tubbs and Edward at the helm. The IT systems were so bad that the internet collapsed on a daily basis and twice a day, the IT bloke would leg it around the office shouting “Don’t save! Don’t save!” as the rickety reporting software (that their entire business depended on), was prone to throw you out, mid-report, losing everything you’d worked on for the past couple of hours. On Wednesdays, everyone was encouraged to evacuate the building quick-smart, at 5pm, as Dad and Daughter used the main office for a personal training session. On day 5, Dad called Sally in, “For a chat,” to express his displeasure as he’d seen her texting in the office. She’s 41. When her 11 year old son rang her to check in, communal eyebrows were raised to the ceiling at her audacity in answering her phone. She attempted to ingratiate herself by nipping to Tesco Express when the milk had run out. When she returned, brandishing a litre of semi-skimmed, her startled co-workers told her in fraught whispers that only skimmed milk was acceptable here. They point-blank refused to use it, presumably in case Mum or Dad found out. Luckily, crisis was averted by IT bloke, who shot out the door in a rapid fashion, returning with a bottle of red top, before the family members were any the wiser. So what of Sally now? Following two more ‘chats’ with Dad over innocuous/heinous misdemeanours (depending where you sit on the weirdo spectrum), she threw in the towel and ran, as fast as her legs could carry her. She lasted 11 days. She swears she’s psychologically scarred, having been left with “a fear of the freak-shows that are small businesses.” She went and got herself a new job for a large, London-based company, with proper systems, a website that works, and all the bells and whistles that the majority of the business world, take for granted. I’d like to make it clear that I don’t share her phobia. Fortunately, the majority of small businesses are well-run, and a pleasure to work for. 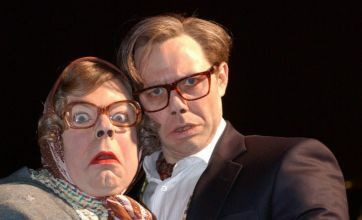 To identify that small minority, and avoid an experience like Sally’s however, I suggest ingesting the complete boxset of The League of Gentlemen, and remaining vigilant at all times. If Papa Lazarou wouldn’t look out of place, don’t even go there!